We return to the subject now not to further develop the basic principles we have already expounded, but to show the risks of tolerance as well as the precautions necessary for its practice. Let us remember, before anything else, that all tolerance, as necessary and legitimate as it may be, has inherent risks. In short, tolerance consists in permitting one evil to exist so as to avoid a greater evil. Now, it follows that the unpunished existence of evil always creates danger, for evil tends necessarily to produce evil effects. Moreover, it is undeniably seductive. Thus, there is the risk that tolerance of itself bears even greater evils than those one desires to forestall by its practice. We must keep this aspect in mind, for our entire study rotates around it. To avoid the aridity of an exclusively doctrinal study, let us imagine the situation of an officer who notes grave signs of agitation among his troops. He finds himself faced with a dilemma: Should he punish those responsible with all the rigor of justice, or should he treat them with tolerance? The second solution begets a range of other questions: In what measure and manner should tolerance be practiced? By applying mild punishments? By not applying them, but summoning those responsible and gently advising them to change their attitude? To feign ignorance of the situation? To begin perhaps with the most benign of these solutions and successively apply the others, in the measure that the more persuasive or mild solutions show themselves insufficient? What is the exact moment in which one should discard one procedure and adopt another more severe? An officer who notes grave signs of agitation among his troops, is faced with the dilemma of punishing those responsible with justice, or treating them with tolerance. 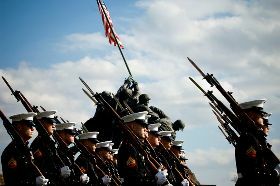 These are questions that may forcefully confront military officers, but they may likewise confront anyone invested with a position of command or responsibility in civil life and clearly conscious of his obligations. What father of a family, department manager, company director, professor, or leader has not faced these questions? How many evils did they avoid by resolving them with perspicacity and vigor of soul? And how many evils had they to grapple with for failing to apply judicious solutions in situations they encountered? In truth, one who finds himself in such a contingency ought first to make an examination of conscience in order to guard himself against the snares that his own personal frame of mind may create. I must say that I have witnessed the greatest absurdities regarding this matter throughout my life, almost all of them leading to excessive tolerance. The evils of our epoch have their present alarming character because there is generalized sympathy in relation to them, a sympathy that even those who combat them frequently share. For example, many people oppose divorce. But among these are found numerous people who, although against divorce, have an excessively sentimental spiritual makeup. Consequently, they consider problems born of “love” romantically. In face of a difficult marital situation among some friends, these “anti-divorcists” judge it super-human, not to say inhuman, to exact of this innocent and unhappy couple that they reject the possibility of “starting over” (which means killing their souls through sin). Hypocritically, they will profess being “sorry about” what happened, but if one were to bring up the problem of tolerance, they will have a whole edifice built up inside for justifying the most extreme and aberrant concessions. Thus, they will comment on what took place with softness, will invite the “newlyweds” over, visit them, and so forth. That is, they will favor divorce by their example while condemning it by their words. Clearly, with such conduct on the part of thousands or millions of opponents of divorce, divorce has much more to gain than to lose. How did they come to the decision to tolerate such an evil as this gnawing cancer of the family? Because deep down they had a pro-divorce mentality. Let us not stop here. Let us have the courage to say the whole truth. Modern man abhors asceticism. He is averse to anything that exacts of his will the effort of saying “no” to his sentiments. He finds the restraint of moral principles odious. The daily struggle against the passions seems to him a Chinese torture. Because of this, modern man, even when gifted with good principles, is exaggeratedly complacent, and not only towards those who are divorced. There are entire legions of parents and teachers who for this very reason are excessively indulgent towards their children and students. And the chorus they sing is always the same: “Poor so-and-so…” Poor so-and-so, indeed, for he is lazy, takes ill the admonitions of his elders, filches snacks, frequents bad company, watches immoral films, and so on. And since he is “poor so-and-so,” he rarely receives the benefit of a rigorous punishment. The fruits are there for all to see. There are thousands, millions, of moral disasters occasioned by excessive tolerance. “He that spareth the rod hateth his son: but he that loveth him correcteth him betimes,” teach the Scriptures (Prov. 13:24). But in our days, who wants to hear it? So too a father of a family, department manager, company director, professor, leader, or anyone invested with a position of command or responsibility, will have to face this dilemma. 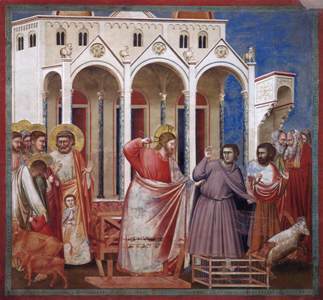 “Expulsion of the Money-changers from the Temple” by Giotto. Now, the same takes place, mutatis mutandis, between certain kinds of managers and workers, since the managers, as paganized as their subordinates, feel that if they were workers they would be rebellious too. And such examples continue to multiply in every field of life. Clearly this tolerance is founded upon all kinds of pretexts—exaggerating the risk of using excessive force or the possibility of things taking care of themselves, people closing their eyes to the dangers of impunity, and so on and so forth. In reality, all this would be avoided if the soul faced with the decision of whether or not to use tolerance were capable, out of humility, of being suspicious of itself. Do I have unconfessed sympathies towards this evil? Am I afraid of the struggle intolerance will bring? Am I too lazy to make the effort that an attitude of intolerance would impose upon me? Do I seek personal advantages of any kind in an accommodating attitude? Only after such an examination of conscience can a person confront the hard alternative of tolerance or intolerance. Without such examination, one cannot be certain of taking, in relation to himself, the necessary precautions to avoid sinning through excessive tolerance. In general, there is some very fitting advice for those who find themselves faced with such an alternative. Everyone has particular bad tendencies that have taken root within him. This one is apathetic, that one is violent, another is ambitious, yet another is cynical, and so forth. 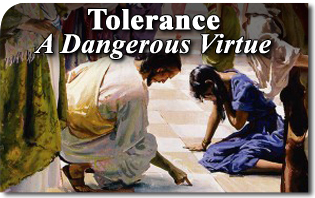 We need not have much fear of sinning through excessive tolerance as long as this tolerance exacts victory over our most deep-rooted bad tendency. But as long as tolerance gratifies our bad inclinations, let us open our eyes, for the risk is grave. Thus, if we are apathetic, we will probably not sin through excessive tolerance toward a friend who rouses us to action: There is nothing more sticky, nothing harder to catch, nothing more choleric than a lazy man contradicted in his lethargy. If we are irascible, we do not run much risk of exaggerated tolerance toward those who harm us. If we are sensual, it is improbable that we will show ourselves excessively rigorous in the matter of sleeves and low necklines. And if we have a servile spirit as regards public opinion, only with difficulty will we overstep ourselves in hurling invectives against the errors of our century. Likewise, it is advisable to have greater fear regarding our own weakness on this point, particularly when the rights of third parties and not ours are in question, thus preventing ourselves from sinning through excessive tolerance. We are habitually much more “understanding” regarding the plights of others. We more easily pardon the thief who robbed our neighbor than the one who broke into our own house. And we are more disposed to recommend that injuries be forgotten than to practice this virtue ourselves. Let us not lose sight of the fact that on this point we, according to the primary impulses of our egoism, quite often find that God is a third party. Hence, we are much more inclined to pardon an offense committed against the Church than one against ourselves, to endure a violation of God’s rights than a violation of our own interests. In general, this is the state of spirit of hyper-tolerant Catholics. Their language is imaginative, soft, and sentimental. They only know how to argue—if one can call this arguing—with their heart. In relation to the enemies of the Church, they are full of illusions, complaisance, courtesy, and expressions of affection. But they are terribly offended if a zealous Catholic causes them to see that they are sacrificing the rights of the Church. And, in place of arguing doctrinally, they transpose the subject to the personal terrain. “Are you saying that I am lukewarm? That I don’t know perfectly well what I have to do? Are you doubting my wisdom? My courage?” The chest heaves, the face reddens, the eyes brim with tears, and the voice takes on a certain tone. Watch out, for this hyper-tolerant soul is nearing the apex of a crisis of intolerance. We will see in the following article how tolerance, in cases where it is just, ought to be practiced. 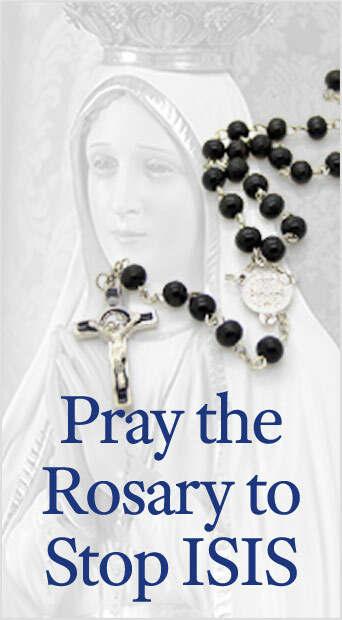 The preceding article was originally published in the Catolicismo, N. 78, in June, 1957. It has been translated and adapted for publication without the author’s revision. –Ed.